The theme this week over on Gingersnaps is botanical. 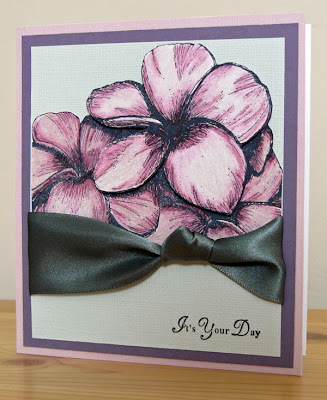 I've made a really simple card with a stamp from ISC - it's a single stamp and really large. The set is called 'Plumeria'. Beautiful image I think, so I kept it the focus and left the card unfussy. Not much point doing a tutorial on this one - I think it's pretty self-explanatory. I coloured the flower with Coloursoft pencils. I coloured the largest flower twice and layered them up to add some dimension. A really easy and quick make but pretty I think. Very pretty and gorgeous coloring! This is beautiful, Katy! Your shading is perfect! This is gorgeous Katy! So much depth to the card and fantastic shading with the pencils. Love that flower - the colouring's really effective. Just Beautiful and Love the simplicity of the bow! Great impact!